A whole year has gone by since the last major WordPress 4.9 version was released. It’s been a busy year for the WordPress developers and a very intense one for the Classic Editor fans who do not want to say goodbye to it. 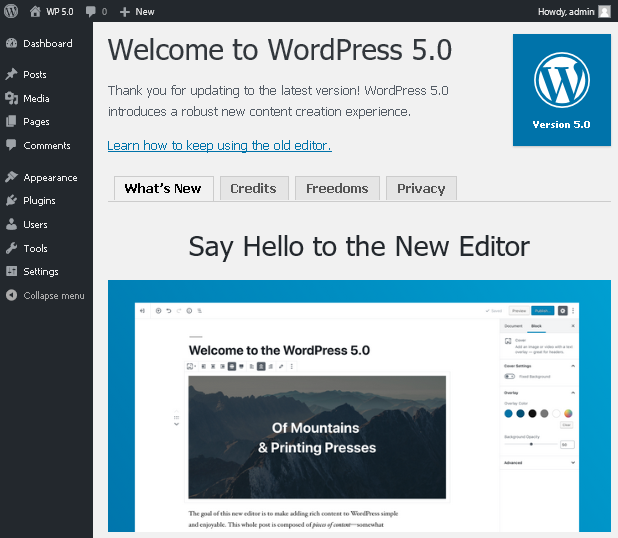 The new WordPress 5.0, however, is now here. This is a release which caused a big fuss in the WP community as it gave reasons for lots of hot debates and discussions. Big changes are always difficult to accept. The switch to Gutenberg is a giant leap for WordPress as it concerns not only users, generating content for their websites, but also developers, who work on plugins and themes for WordPress. As expected and specified in the schedule for 5.0, WordPress 5.0 Bebo is more kind of a WordPress 4.9.8 + Gutenberg. The newest element in version 5.0 is basically the Gutenberg editor. PHP 7.3 Compatibility. This improvement is very important as it increases the level of security for WordPress. Because of it sooner or later you will need to update to version 5.0. WordPress 5.0 is available in Softaculous and WordPress Manager by SuperHosting for new installations. From now on Gutenberg is the main editor in WordPress. After updating to 5.0 it will be the default editor for your website. 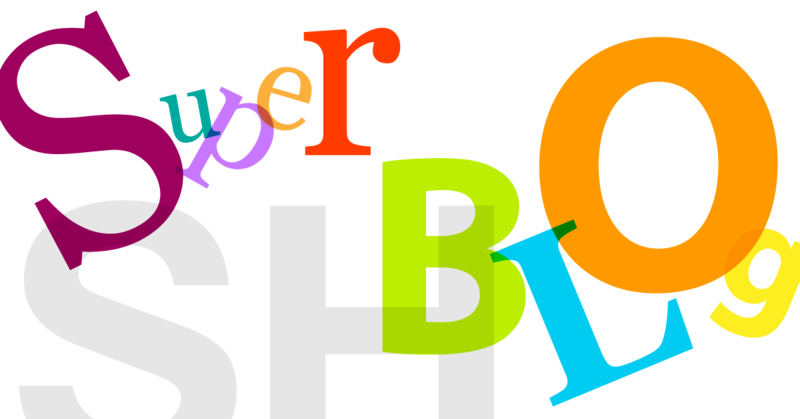 There are more than 20 blocks available by default in the editor - text, paragraph, list, heading, table, button, columns, image, audio, video, code, user HTML code, shortcodes, separator and others. Gutenberg offers fully responsive design. The editor allows work from a mobile device, as well as all types of screens and resolutions. It enables direct content editing as what you see in the editor appears in the same way in the website's front-end. API block for creating static and dynamic blocks - developers of plugins and themes will be able to create additional blocks for Gutenberg. Block templates - you can create pre-arranged templates with blocks. These templates can be reused in articles or on pages. Shared blocks used in articles are updated from one place as changes are immediately published everywhere. Nested and child blocks. Blocks in blocks. Child blocks work only if the parent block is available. The Classic Editor is preserved for now as a plugin and you can keep using it after version 5.0. For new WordPress 5+ websites, Gutenberg will be the default editor as the Classic Editor can be installed as an additional plugin. By using the Classic Editor plugin you can replace Gutenberg. The Classic Editor plugin will be supported by WordPress as updates will be released until 2021. WordPress releasing the Gutenbеrg editor is such a big jump for some users that it gets to a fork for WordPress - ClassicPress, which is basically the same thing, but without Gutenberg. Drupal's team are already working on the integration of Gutenberg into the system. 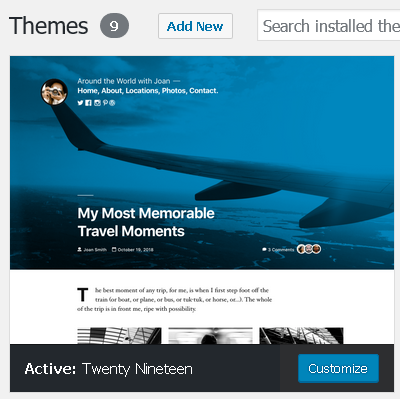 A new default WordPress theme has been long-awaited. Twenty Nineteen is fully compatible with Gutenberg as it offers styles both for the front-end and the back-end, which makes generating content very close to the WYSIWYG rule ("What you see is what you get"). This theme belongs to a new generation WordPress themes about to be released in the future. Those themes will benefit from all advantages of Gutenberg and the freedom it provides for generating content in whatever place and layout a user wishes. Besides Twenty Nineteen, all system themes up to Twenty Seventeen have been redesigned so as to support the new editor. WordPress will not automatically update to version 5.0 by default. You need to manually perform it from the website administration. Important: You do not need to update to WordPress 5.0 immediately. Wait a bit until the next minor version (5.0+) is released where many bugfixes and problems will be solved. Before taking any actions, make a full backup of the website and its database. You can easily backup your website through cPanel » Backup Manager by SuperHosting. You can quickly and easily restore a WordPress website from a system generated backup through the cPanel tool - WordPress Manager by SuperHosting - Restore from Backup. You can do this in cPanel » Softaculous » Staging. Then make whatever changes, updates or tests you wish. Update the copy to the latest WordPress version. Update all available plugins and the website theme. Test working with the new editor in details by creating a post or a page. Edit a post and a page to see what will change. The new editor should be compatible by default with all plugins and themes which do not add features or are not directly related to such ones in the Classic Editor. On the other hand, plugins and themes directly related to the Classic Editor and content editing shall be upgraded by their developers in terms of compatibility with Gutenberg. Themes which have nothing in common with the Classic Editor are compatible with Gutenberg by default as they will need the slightest enhancement so that they add their layout to the new content editor. Check for theme updates and update if there are newer versions. Make sure the plugins you use are compatible with the WordPress version. If necessary, update the plugins to their latest versions. In case you are using WooCommerce you need to update it to 3.5.1+. This version supports WordPress 5.0. If everything is working properly, transfer the changes from the test copy to the real website. In case there is a plugin/theme that is not working properly, check for a bugfix or update. What is the importance of updating WordPress to 5.0? Even if you consider this too much of a challenge, it's crucial to update your WordPress. We do not recommend using old versions of the CMS. The bugfixes and improvements to follow for version 5.0 will increase the system's security together with the pleasure of using it. The biggest change in 5.0 is the content editor. The features that don't relate to it doesn't change. This version supports the newest PHP 7.3 which offers an improved level of security. Thus WordPress security itself gets automatically increased. Avoiding updating WordPress only because of the new editor can cause more inconveniences and problems in the future than if you decide to take some time to test Gutenberg and install the Classic Editor plugin. The first stage of integrating Gutenberg into WordPress is complete with version 5.0. It was aiming at implementing blocks into the content work process in WordPress. We await the start of the second stage, which will take the idea of blocks outside the editor’s limits and beyond editing posts/pages. Blocks will be used in the website design management, widgets will be replaced with blocks, menus will be upgraded to navigation blocks and many others. Gutenberg poses many interesting challenges for the WP developers as well as numerous improvements and exciting news for us, the fans. According to the WordPress 5.0 schedule minor system versions (5.x) will be released every two weeks. This means that very soon we can expect the next improvements of the new editor and the CMS to be released. So check our blog often so as not to miss them.